The Hon. 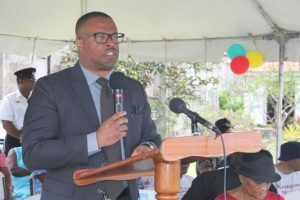 Mark Brantley, premier of Nevis, delivers remarks at the 15th anniversary celebration of the Nevisian Heritage Village in Gingerland Feb. 22. Premier of Nevis and Minister of Foreign Affairs, the Honourable Mark Brantley, has rubbished the “illogical arguments” put forward by Leader of the Opposition, the Right Honourable Dr. Denzil Douglas, in support of his holding and using of a diplomatic passport of the Commonwealth of Dominica. This comes after the High Court, acting on the Government’s request, has postponed hearing the matter until April. The Government had asked for more time to prepare for an expert witness to testify. Dr. Douglas, the Parliamentary Representative for St. Christopher Six, has admitted in a sworn affidavit, filed in the High Court Registry on February 21, 2018, that he filled out an application form and was issued with a diplomatic passport of Dominica that lists his nationality as Dominican and on which he has travelled. The Attorney General, the Hon. Vincent Byron, acting on advice of learned Senior Counsel Douglas Mendes of Trinidad and Tobago is asking the High Court to declare that Dr. Douglas has vacated his seat in the National Assembly by holding a diplomatic passport of the Commonwealth of Dominica. The Constitutional Motion also seeks an injunction to restrain Dr. Douglas from taking part in the proceedings of the National Assembly. Section 28 (1) of the Constitution of St. Christopher and Nevis and Section Six (6) of the National Assemblies Act both provide that “a person shall not be qualified to be elected or appointed as a member if he is by virtue of his own act under any acknowledgment of allegiance, obedience or adherence to a foreign power or state”, said the Attorney General. The parliamentary disqualification case had its first hearing in the High Court on February 26 before Resident High Court Judge His Lordship Justice Trevor Ward Q.C. 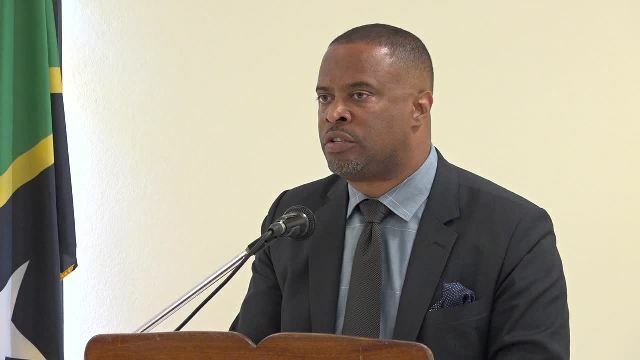 Speaking at the Team Unity Government town hall meeting on Tuesday (February 27) evening, Premier Brantley said the revelations made in Dr. Douglas’ sworn affidavit raise several critically important questions. “If the good gentleman received a document which he says was given to him as a matter of courtesy by Dominica… [and] he said I did not fill out anything to say I am any citizen of Dominica, well if you did not fill it out and the computer filled it out for you so that you end up with a document – a passport which says Denzil Llewellyn Douglas citizen/national of Dominica, why would you use the document to travel the world?” Premier Brantley asked. Dr. Douglas has in the past shown disdain for holders of dual citizenship participating in Parliamentary life. This was evident when he led the charge against Lindsay Grant and Shawn Richards, both of whom had to renounce their US passports. The Denzil Douglas regime also initiated court actions against Eugene Hamilton challenging the validity of his 2010 election victory, over his possession of a United States green card. Pointing to the further hypocrisy of the former prime minister, Premier Brantley said Dr. Douglas famously denied him a diplomatic passport of St. Kitts and Nevis while he served as Leader of the Opposition.